I love how this website is never in shortage of awesome bathroom design ideas to inspire the plans I have for my own home. We bought a rather old home last year and have been immersed in the long and arduous process of planning and completing a total renovation. The first major room we tackled was the kitchen, but we have since moved on to the bathroom remodel stage. We have four bathrooms in the house, each with extremely outdated 1970s tile and fixtures. One is an atrocious shade of green and another a ghastly peach color. Needless to say we are in desperate need of bathroom design ideas, especially those on a budget. We really like bathrooms that look like this one. No matter the size of your home, great bathroom decor is the key to making it marketable and functional, as well as a lovely addition to your home. The room just needed a fresh coat of paint and a few nice bathroom design ideas to make the space look finished. I started by painting the walls in this lovely grey color that coordinates nicely with the marble. We found this funky accent cabinet in a similar ashy grey color that perfectly offsets the walls and tile. We recently upgraded the style of our small bathroom for guests and I think the the little touches we added really improves the overall look. The base of the room was already quite nice. When I designing a home remodel, I love incorporating modern bathroom ideas that feature funky styles and unique features. This room is one of my favorites that I recently completed because it looks like you walked right into a spa, even though it is in a completely average suburban house. 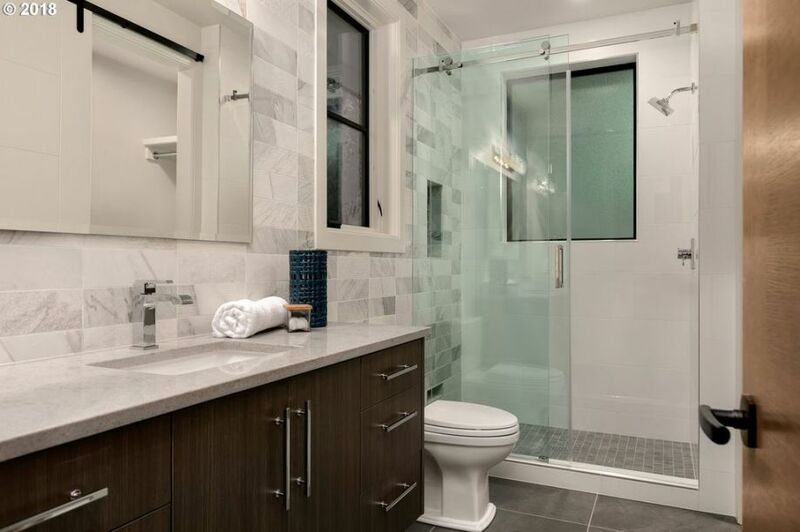 The key to achieving this look was adding creative bathroom design ideas that are rarely used in residential floorplans. This includes wide bamboo plank flooring with drainage, a free standing steam shower, stucco walls, and nearly invisible fixtures. I also love the ultra modern bathtub ideas that we used, with the freestanding look and nearly invisible faucet. The entire design is so unusual and impressive. The statement piece in this gorgous “zen” bathroom is certainly the large open shower. Small bathroom ideas can be just as beautiful as full size master suites. It is all about how you incorporate the hottest design trends for 2019 in a scale that is right for you space. This beautiful bathroom is a fantastic example of this concept done well. The designer opted to do a modern bathroom design with trendy marble wall tiles and a fantastic contemporary style wood veneer vanity. The size of each element is perfect for the smaller floorplan. Despite being quite bold in design, the combination does not overwhelm the small space but, instead, actually makes it seem much larger. I have been browsing around this site looking for inspiration on how to redo our master bath and found this fantastic bathroom layout.I have been pretty underwhelmed by the bathroom design ideas I have found so far, but this one is simply stunning. 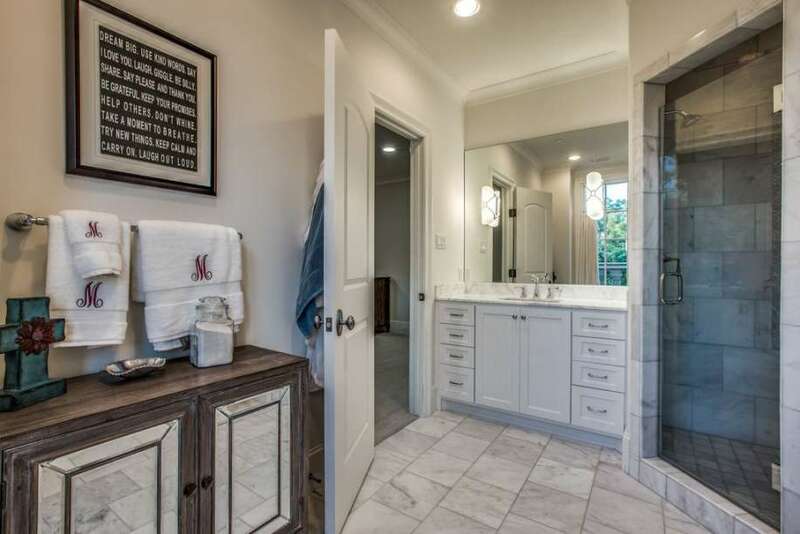 I love the completely separate his and her vanity stations complete with tons of shelving and panelling built around each mirror. There is so much storage I wouldn’t know what to do with it! Once you peel your eyes off the gorgous vanities, you notice the large glass enclosed shower in the center. The beautiful Italian marble tile is the epitome of luxury, and is perfectly accented by the polished nickel duel shower heads and steam feature. Bathroom vanities can be such an annoying item to pick out when you are renovating your home because there are just so many to choose from. And, quite frankly, I did not like any of them. So many were way too traditional and did not go with any of the modern bathroom design ideas I had picked out. I wanted our master bath to have a very contemporary and almost industrial feel to it. We settled on a neutral beige color palette with pops of bronze, chrome, and natural wood to set it off. I loved bathroom flooring ideas that mimicked the look of natural unstained wood, so we installed this awesome tile that captures the style exactly.